Jascha Heifetz: God’s Fiddler, the American Masters documentary which aired last week on PBS, offers an inside look at the life of one of the twentieth century’s most influential violinists. The program includes rare film and audio clips and features interviews with prominent contemporary violinists and former Heifetz students. It follows Heifetz from child prodigy roots in Russia, where he was a student of Leopold Auer at the Saint Petersburg Conservatory, to his immigration to the United States and longtime residence in Southern California. In addition to his private and somewhat lonely personal temperament, the documentary highlights Heifetz’s rigorous sense of discipline and emphasis on scales. 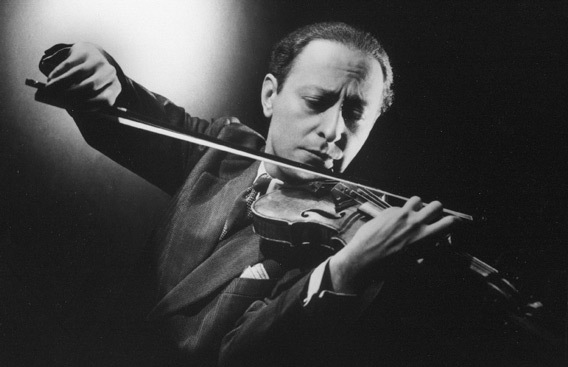 Jascha Heifetz raised the bar for all violinists who followed, his name becoming synonymous with technical perfection. His recordings suggest an exhilarating sense of pushing limits…staying right “on the edge” without ever falling. This quality seems to have been present from the beginning. 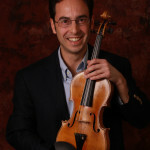 As the story goes, the young Jascha launched into Paganini’s Moto perpetuo at such a stunningly fast tempo that Leopold Auer gasped, saying, “He doesn’t even realize that it can’t be played that fast.” Heifetz’s playing transcended sentimentality, unleashing raw power and blinding intensity. If I don’t practice one day, I know it; two days, the critics know it; three days, the public knows it. Thank you for posting this – what a wonderful wealth of information about one of the most treasured figures in 20th century violin performance and pedagogy! Heifetz has always been a musical hero of mine, since I saw an old movie of his, “They Shall Have Music”, which I saw on television as a child – long before the establishment of “El Sistema” – or any other such organization, there was Jascha, promoting the idea of free music lessons to underprivileged children … it inspired me to dedicate my life to music (which I have) – and I’ve never looked back since. Once again, thank you – I’ve shared this page on my Twitter feed, which also posted it to my Facebook page – I only hope many others take the opportunity to follow the links and indulge in the beauty of this fine player and the legacy he has left us all through his amazing performances and his wonderful life.